The Ponderosa Country Barn is 44 feet by 60 feet with a 24 foot Center, 10-foot Lean-To’s, 10 Foot Porch. This 44 foot by 60-foot Ponderosa Country Barn Home features a tower with a drive-through. All of the Sand Creek Post & Beam wood barn kits feature beautifully crafted post and beam timber frame construction. The custom designed barn style houses have been used for party barns, horse barns, equipment and toy storage, detached garages, loft living, event centers, and wedding facilities. The barn kits are rustic yet sophisticated, with barns that are pre-manufactured, shipped as a barn kit, and built to last generations. This barn is located in California. All Sand Creek Post & Beam barn kit frames are pre-assembled to ensure a perfect fit before they are disassembled for shipment. The result is an attractive, extremely sturdy barn home kit that will enhance your property and provide you with several years of enjoyment. With a variety of barn styles, sizes, options and barn accessories to choose, Sand Creek Post & Beam big timber barn kits and outbuilding kits can be custom designed to create a one-of-a-kind barn. You need only to have a foundation on which to build the barn and the shingles of your choice to complete your barn or outbuilding. Sand Creek Post and Beam can custom design your barn style house. They offer a variety of barn kits in standard styles and sizes. They also offer options such as open and closed lean-tos and dormers, as well as a variety of sizes and styles of their hand-crafted cupolas, doors, and windows. One of the advantages of post and beam (timber frame) barn construction is in its flexibility with the placement of options and barn accessories. 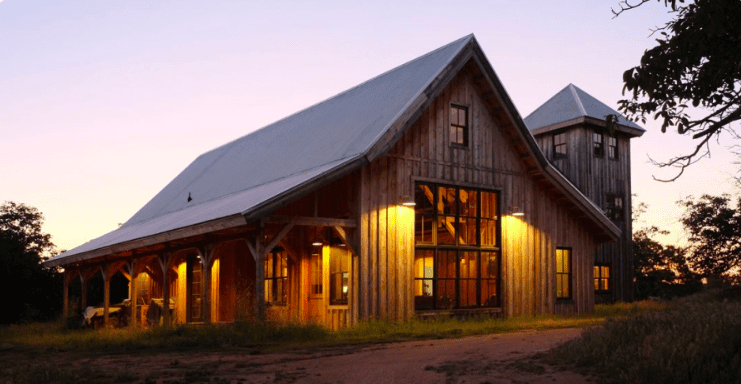 Whether you choose from their standard selections or have something completely different in mind, the CAD department at Sand Creek Post and Beam can easily work with you to create a completely custom barn design. Each Sand Creek Post & Beam barn kit has all of the building materials you need to build your barn house kit on a sturdy foundation. The standard barn style house kit building materials include Eastern red cedar sill plates, the sill plate brackets, pre-cut post and beam frame, soffit and fascia, trim, board and batten vertical siding, roof tar paper, roof sheathing, exterior walk-out door and windows, hardware and fasteners, gable vents and 1/4 inch steel joinery plates. Each barn house kit may have other components included depending on the style, options and accessories. Sand Creek Post & Beam uses full dimension six foot by six-foot rough cut wood, for its authentic, rustic look and its additional strength. The result is a beautiful rich look inside and out. Other species of wood can be ordered for your barn home kit, with Ponderosa pine and Norway pine being their woods of choice. Ponderosa pine is wood that is known for its honey-toned hue and is used where the barn style house appearance is of primary importance. Norway pine is the wood that has a straight grain and even texture, with strength properties that are perfect for posts, beams and trusses. Both kinds of wood used for the barn kits are easy to work with and have been specially milled to their specifications. LOTS of Houses Copyright © 2019.